President Donald Trump has overturned decades of US policy by saying it is time to recognise Israel's sovereignty over the occupied Golan Heights, which it captured from Syria in 1967. In a tweet, Mr Trump declared that the plateau was of "critical strategic and security importance to the State of Israel and regional stability". 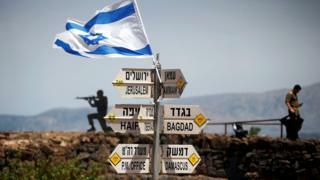 Israel annexed the Golan in 1981 in a move not recognised internationally. Syria, which has sought to regain the region, has so far made no comments. Israeli Prime Minister Benjamin Netanyahu - who has warned about the "military entrenchment" of his country's arch-enemy Iran in Syria and has ordered air strikes in an attempt to thwart it - tweeted his thanks to Mr Trump. "At a time when Iran seeks to use Syria as a platform to destroy Israel, President Trump boldly recognises Israeli sovereignty over the Golan Heights," he wrote. Richard Haass, a former senior US state department official who is now president of the Council on Foreign Relations think-tank, said he "strongly disagreed" with Mr Trump. He said such recognising Israeli sovereignty would violate a UN Security Council resolution, "which rules out acquiring territory by war". The president's declaration comes as Mr Netanyahu faces a closely fought general election on 9 April, as well as a series of possible corruption charges. In 2017, Mr Trump recognised Jerusalem as Israel's capital and ordered the relocation of the US embassy to the city from Tel Aviv. The decision was condemned by Palestinians, who want East Jerusalem to be the capital of a future Palestinian state, and the UN General Assembly demanded its cancellation. Was President Trump's tweet a surprise for even his closest aides? The press travelling with the Secretary of State Mike Pompeo was waiting at Prime Minister Netanyahu's house to hear from both men, when word of Mr Trump's Golan decision came through. They delayed their appearance long enough for us to wonder whether they were scrambling to formulate a response. But if the announcement came as a surprise, it was a good surprise for Mr Netanyahu - "I'm so excited" were his first words to us. And the surprise would have been in the timing, not the substance, because the idea of the US recognising Israel's sovereignty over the Golan has been under active consideration in the Trump administration for some time. Israel has gained traction in the White House and parts of Congress by arguing that Iran is using Syria as a base from which to target Israel, with the Golan Heights as the front line. But the formal US recognition doesn't change anything on the ground: Israel was already acting with full military authority. If so, it's one that violates important principles of international law, they say: Mr Trump has endorsed the seizure of territory, and will have no moral authority to criticise Russia for doing so in Ukraine's Crimea. The region is located about 60km (40 miles) south-west of the Syrian capital, Damascus, and covers about 1,200 sq km (400 sq miles). Israel seized most of the Golan from Syria in the closing stages of the 1967 Middle East war, and thwarted a Syrian attempt to retake the region during the 1973 war. The two countries agreed a disengagement plan the following year that involved the creation of a 70km-long (44-mile) demilitarised zone patrolled by a United Nations observer force. But they remained technically in a state of war. In 1981, Israel's parliament passed legislation applying Israeli "law, jurisdiction, and administration" to the Golan, in effect annexing the territory. But the international community did not recognise the move and maintained that the Golan was occupied Syrian territory. UN Security Council Resolution 497 declared the Israeli decision "null and void and without international legal effect". Three years ago, when former President Barack Obama was in office, the US voted in favour of a Security Council statement expressing deep concern that Mr Netanyahu had declared Israel would never relinquish the Golan. Syria has always insisted that it will not agree a peace deal with Israel unless it withdraws from the whole of the Golan. The last US-brokered direct peace talks broke down in 2000, while Turkey mediated in indirect talks in 2008. There are more than 30 Israeli settlements in the Golan, which are home to an estimated 20,000 people. The settlements are considered illegal under international law, although Israel disputes this. The settlers live alongside some 20,000 Syrians, most of them Druze Arabs, who did not flee when the Golan was captured. Trumplomacy on Golan - what does it mean?